A few weeks ago I posted rather ecstatically about the saucy Cantonese noodles served at a coffeeshop in Kuala Terenganu's Chinatown. In response, reader slau recommended that I give the version served at Yook Woo Hin, on Jalan Petaling, a try. Last weekend -what with the big holiday just around the corner - seemed like a golden time to head Chinatown way and do a bit of grazing. The average tourist could be forgiven for thinking there's not a lot of interest in KL's Chinatown. 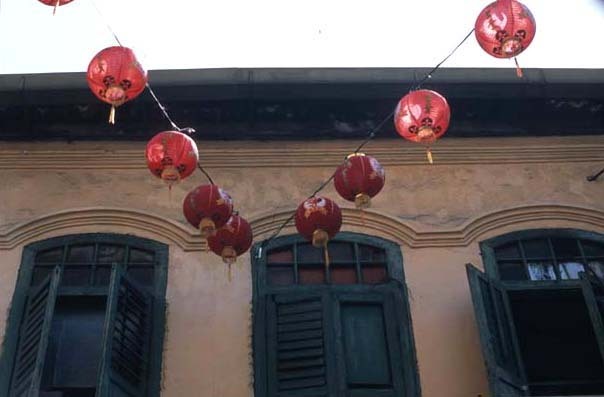 Jalan Petaling, Chinatown's main street and the one that seems, by observation, to lure the most visitors, is lined by a tedious assortment of clothing, cheap watch and trinket, and kitschy goo-ga stalls. Walking down the middle of Petaling, I get the sort "I-could-be-anywhere-in-Asia" feeling that would make me want to run screaming back to my hotel room, if I had one. But, if you duck behind the vendors and walk the sidewalk you'll find that Chinatown is, in some part, still there. An entrance to the dim aisles of the wet market (pretty much over by 10:30am), with its fish and pork and chicken (live, if you wish) and fresh tofu vendors juts off Petaling (it's marked by a roast pork stall). And there are a few atmospheric old coffee shops. Yook Woo Hin is one of them. Yook Woo Hin is a typical (and, to me, loveable) Chinese coffeeshop - dimly lit, loud, staffed by stone-faced waitresses (though they'll crack a smile if you do first) who seem to have been there forever and populated by neighborhood oldtimers who've been taking their meals there even longer. It's been dishing grub and coffee for some 50 years, and by the settled-in looks of it, will continue to do so for another half century. Get there before 9am and you'll have a choice of dim sum (the deliciously sturdy, belly-filling coffeeshop kind, not the dainty, delicately flavored restaurant kind). After 9:30 you've a choice of noodles, fried rice, char siew (BBQ pork), and various stir-fried dishes. We came for the seafood Cantonese noodles (a mixed meat version is offered as well), and decided to make a meal of it by adding a plate of greens stir-fried with garlic and an order of lam yee kuat (spareribs in fermented soy bean). Dishes come out of the kitchen just one or two at a time, so this is not the place to go if you're in a hurry. Sitting at the back of the shop, we were obliged to hungrily eye everything headed for other tables for the 25 minutes that we waited for our order (observation: the fried rice is very popular here). When ordering our Cantonese noodles I neglected to specify crispy, deep-fried yee meen noodles, so we ended up with fresh rice noodles instead. No matter. 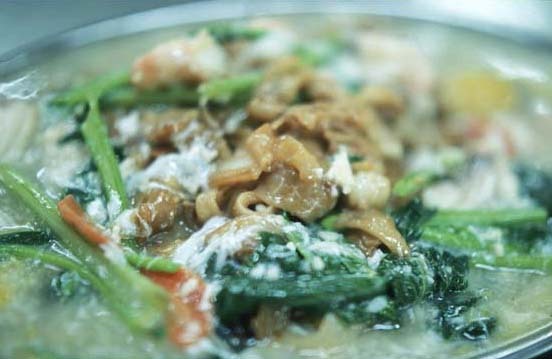 The wide, thick, and very chewy noodles had been first stir-fried with dark soy and then topped with large chunks of firm white fish, a few small shrimp, slices of carrot, thin coins of ginger soft enough to eat, and enough choy sum to make a greens lover like me exceedingly happy. All was swimming in a mild gravy thick with egg yolks and whites. (The white pepper in the photo is our addition). If I lived in the 'hood these noodles - delectable, satisfying, oh-so-comforting - would grace my brunch table at least five times a week. Our lam yee kuat was one pleasing plate of pig. 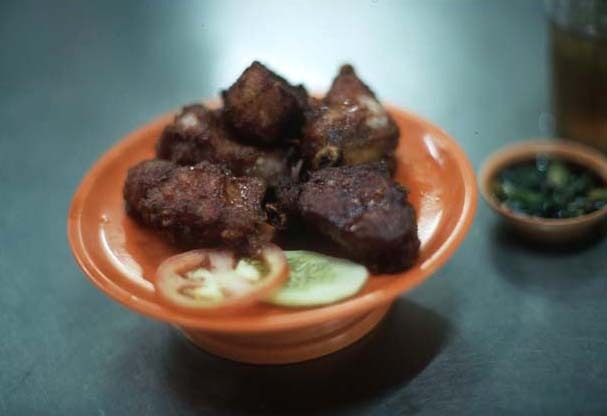 The ribs are marinated in fermented soy bean and then deep-fried, yielding a browned, crunchy crust enclosing tender, fatty (in a good way) meat. Salty from the soybeans, these finger-licking good (a cliche, I know, but it applies here) tasties are best enjoyed hot. Our greens? First-rate, but how many photos of stir-fried greens does one food blog need? After lunch we headed back down Petaling and took a right at Jalan Jang Lekir, with the intention of ending our excursion with a few on-the-hoof nibbles. A biscuit shop/bakery beckoned. Inside, a glass case with an admirable selection of Chinese sweet and savory baked goods. I'm a sucker for anything char siew, and these glossy char siew buns with the cute little topknot called my name. For comparison purposes we decided to sample the Shanghai char siew as well, in addition to a kaya puff and a coconut tart. The latter two were forgettable (sweet overpowering coconut flavor in both), but the char siew were lovely - sweetish, smoky pork filling in a firm crust (buns) and a soft, flaky pastry (Shanghai version). Worth returning for (which I did, in fact, two days later). 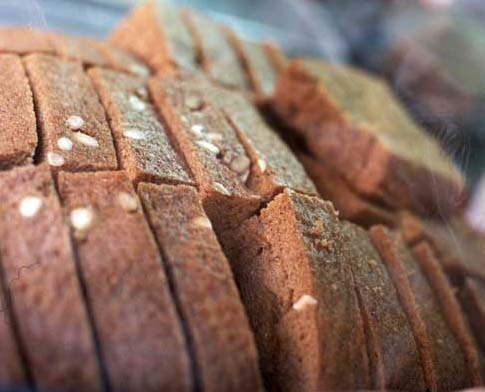 Across the street, a vendor with a glass case sells steamed spice bread. This is a treat I breakfasted on regularly in Hong Kong; our first apartment n Happy Valley, overlooking the race course, was nicely situated just a few minutes' walk from a shop that sold it fresh from the steamer. It's light and it's fluffy, yet not insubstantial - a hefty dose of aromatic spices (cinnamon? cloves? anise?) lends flavorful heft. And it occurred to me later, as I munched on a piece at home, that this bread would make a delightful dessert, layered with whipping cream and fresh strawberries. At this point our appetites were a bit .... stretched. But down the lane behind the steamed bread vendor, at the mouth of an alley off Jalan Sultan, awaited the bao (buns) of our dreams. You'll know the place by the big bamboo steamers. 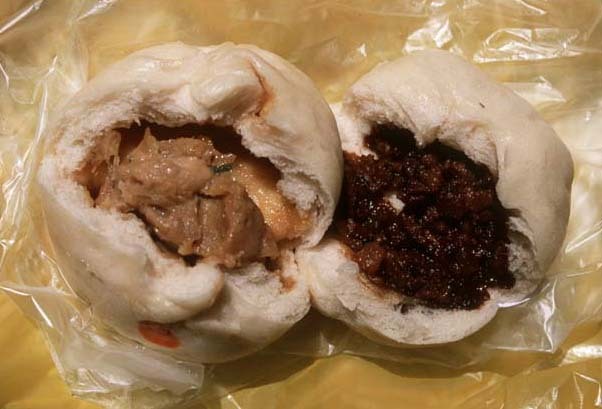 Once you've found it, you'll have a choice of pork, char siew, or "big" buns. The first thing to note about these bao is the dough. This is the sort of strong, thick dough you'll find gracing steamed bao in China. Mantou dough. 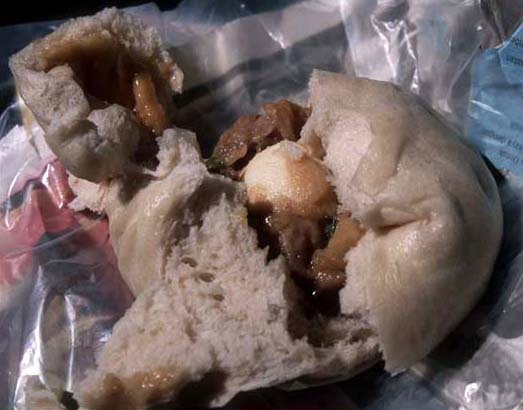 It's a whole other animal to the pure white, fluffy dough that makes up a Hong Kong-style steamed bun. It also happens to be my preferred dough. 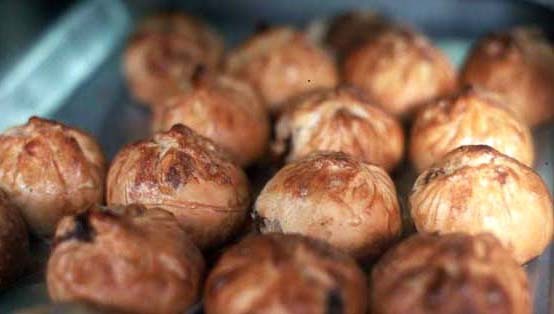 I love its chew, and I love the substantiveness is lends to a bao. This vendor's char siew is oh-so-piggy, very chunky (I don't care for uber-minced char siew in my bao), well and complexly seasoned, and not too sweet. The plain pork is simply - and yummily - savory. The big bun is, well, big - too big for that moment in time, but we were compelled. Inside, hard-boiled egg and a salty, assertively soy-flavored chopped chicken filling. Imagine the very best, least saucy version of stir-fried chicken you've ever eaten. Now imagine it in a bun with an egg. This is, unless you're a glutton (guilty, I'm afraid), a meal in itself. And so ended our afternoon of indulgence on the streets of KL's Chinatown. Definately a non-halal Saturday. Yook Woo Hin. 100 Jalan Petaling. Early morning till 3pm, closed Thursdays. 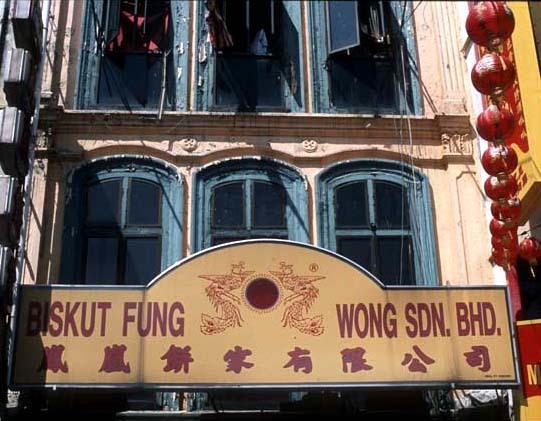 Biskut Fung Wong. Jalan Hang Lekir between Jalans Petaling and Sultan. 9am-10pm. Bau vendor. 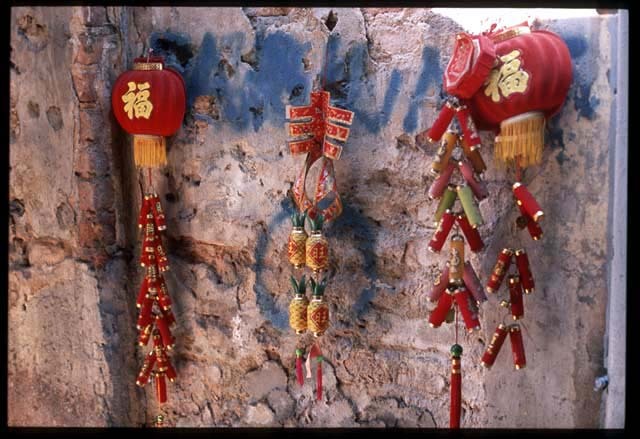 At the mouth of an alley off of Jalan Sultan, between Jalans Hang Lekir and Hang Jebat (on your right as your walking from Lekir to Jebat). I can hardly begin to desribe the pleasure I get from your blog. What better way to survive a cold and cloudy winter in London working in a basement with no windows, going to work in the dark, coming home in the dark than being transported to a different place and being assaulted with so many smells, tastes, textures and colours that you both dish out in every blog. oh how i love your blog! you bring me back to my childhood-those "big paus" were a treat for me. it was quite the affair opening into one of those with my chopsticks and slowly eating it inside out. my favourite part which i would always leave to the last is the quarter of a hard boiled egg. Hi Robyn - Yook Woo Hin distinctly rings a bell but for the life of me, can' remember the details. For some reason I seem to remember Damansara Utama - could they also be in the burbs or did they move? I will have to check with my friends who are still in KL. Melissa - have to admit I couldn't quite choke down the hardboiled egg in this bun ... there was precious little room left in my stomach by that point! James, oh that does sound horrible. I don't miss winter. Glad I can bring a little brightness into your dark chilly winter!